For those who don't know where Mill Creek's many parks are located, Cougar Park is on 148th Street at the entrance to the Brighton neighborhood and across the street from Mill Creek Elementary School. 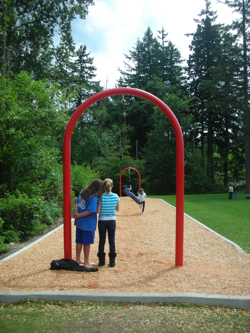 This playgound equipment was purchased from Sequim's All Play Systems, the local representative for the German manufacturer Berliner. The cable ride length is 100 feet long, making this the longest children's cable ride in the region. 100 feet is the maximum length made by the manufacturer. Most of these rides are in the 50 to 60 feet range. The ride has quickly become a big hit with neighborhood kids and will provide many years of fun at Cougar Park.